Pure Protein’s Whey Powder is a fast-acting protein powder that provides all of the essential amino acids needed to help support lean muscle, energy, vitality, and strength. Packed with 25 grams of protein, each nutritious serving of Pure Protein Whey Powder is a low-fat, great-tasting treat that can help satisfy your appetite any time of the day. 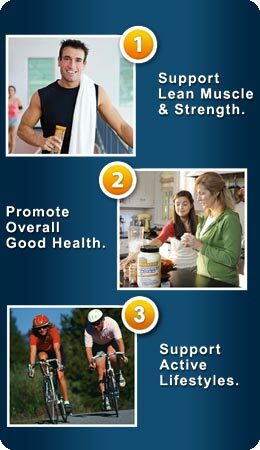 Pure Protein is a premium line of delicious protein products specially designed to supplement your nutritional plan with the protein necessary for a lean, healthy, and strong body. Pure Protein’s goal is to provide you with great-tasting, convenient protein products perfect for when temptation strikes. No matter what your age, gender, or workout goal, protein is a vital nutrient important for overall health. Protein plays a number of different roles in the body: it repairs cells, builds and repairs muscles and bones, provides a source of energy, and controls many of the important processes in your body related to metabolism. 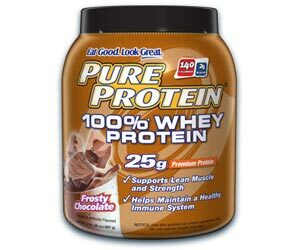 Pure Protein Frosty Chocolate 100 Percent Whey Protein Powdere (2 Pounds). Pure Protein Whey Protein contains 25 grams of Premium Protein, 160 calories and only 2 grams of sugar.